We are sad to announce that Scott Petersen transitioned from our presence on Sunday, December 15, 2013 at the age of 59. From knowing Scott for years and an interview from 2001, here is a portion of Scott’s story. Scott went to South America for 3 to 4 months every summer at the end of the school year to teach skiing in Argentina, doing business in Peru and Bolivia importing Alpaca sweaters. Scott was introduced to ayahuasca by a shaman in Tarapoto, Peru. He met some Shipibo Indians working there who took him to Pucallpa. He started working with the Shipibo at Yarinaqucha. He subsequently moved to Cusco to be a translator and guide while learning the traditions of Andean shamanism. It was around this time that Scott made the most difficult decision of his life. “I wasn’t really letting anybody down but myself if I’d stayed in the program. I had to leave and risk everything. Step off. That gave me the badge of self-confidence. Any obstacle that revealed itself after that I would deal with humor and strength. Scott persisted in studying and learning from the ayahuasceros and shamans of the Amazon basin, but was frustrated by the norm of manipulative shamans and the games they were playing with their clients. He had a vision of developing an environment that encompassed the positive and powerful healing that evolved from thousands of years of indigenous medicine, a place where clients would be safe, and the medicine and natural herbs and plants of the Amazon could be studied and shared, replacing ancient mythology with the advances of Western science and technology. He began looking for the right time and place to enact that vision. While working as a translator for Don Agustin Rivas in Tamshiyaku Peru, he found an ideal location nearby, and that became the Refugio Altiplano. With his tenacious nature and goals firmly in mind, he organically grew his business. 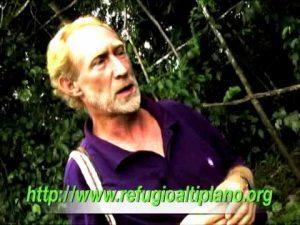 His model, which utilized the best shamans in the Amazon basin to perform ceremonies, and included growing and using the highest quality medicines and herbs, and providing a professional level of psychological counselling, brought a consistent level of experiences to the Refugio clients that could not be matched. Being a consummate businessman, he brought on professional advisors and investors to support his vision, growing the facility into the largest of its kind in the world. Thousands have enjoyed transformative experiences delivered directly by the ancient plants and nature of the Amazon jungle at the Refugio Altiplano. Over time, the extreme challenges of the jungle brought psychological and physical challenges to Scott and he increasingly struggled to maintain his focus. Our beloved and stubborn friend was starting to take more and more time off and had begun a transition of the management that could free him of the day-to-day operations. Sadly, Scott died as a result of injuries sustained in a fall, ending his part in the fulfilment of his vision and his freedom here on Earth. You’re grieving and grieving is part of a process. If you were numb and incapable of feeling at this point, that would be worrisome! But you’re not. You’re feeling exactly what you should be feeling…and that means that you respect and that you are assimilating what happened. And that means a year from now you’re going to go beyond it…If you try to do that too quickly, what happens is that you lop off a big part of your own psyche and leave it behind locked up in bags somewhere stashed in a closet and you wonder why you no longer have any spontaneity or energy.